We should expect there to be a reward for taking risk. This is the principle on which the stock markets work, and financial investment in general. This is different from thinking that flirting with danger of itself should be rewarded, and instead reflects the way that financial investors see risk – as variability rather then the prospect of danger or harm. Statisticians and analysts measure variability in financial data – they call it things like variance or standard deviation in outcomes like profit. And one way that they picture this is in normal curves (a.k.a “bell” curves) like the ones below. Narrow tall bell curves represent limited variability of likely outcomes – and therefor represent low risk options. 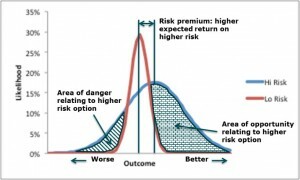 Wide bell curves represent high levels of variability of outcomes, and therefore higher risk. This diagram seeks to show that when comparing different financial investments with different risk profiles, we should expect to gain from the higher risk option. This is sometimes referred to as the risk/return tradeoff. The risk in financial markets is measured as variability over time or between investments, as I touched on in Chapter 4 when talking about definition of risk. This may be variability of share price, or indeed profit, or some other important measure. So an investment where this key measure varies a lot over time is higher risk than one where the measure is more stable. This risk and variability tends to follow patterns by certain groupings of investments, for example by industry sector. So a new technology sector such as the bio-technical sector, with smaller companies and unproven technology would be a higher risk sector than for example consumer goods, with established large organisations with mostly established brands and technologies. So according to our risk-return thinking, we would expect to get a higher return from an investment in the bio-medical sector compared to the consumer goods sector. As we explored in Chapter 4, one way we represent this variability is through the normal curve, sometimes called the bell curve. So for example, our likely financial returns in a given sector, are distributed around our expected return, the peak of the normal curve. If there is a wide range of expected returns, this is a high risk situations which is represent by the wide normal curve. A lower risk sector with a smaller range of possible returns is represented by the taller narrower normal curve. Lets look at this diagram more closely because it highlights a fascinating insight when we look at risk in this way. There are two shaded areas in the diagram. The shaded area on the left, what I have called the area of danger, is the main reason why we may not go for the higher risk option. This represents all those possibly outcomes or returns that are worse than our expected outcome, that are more likely to occur if we choose the high risk option. But now, lets look at the shaded area on the right side. 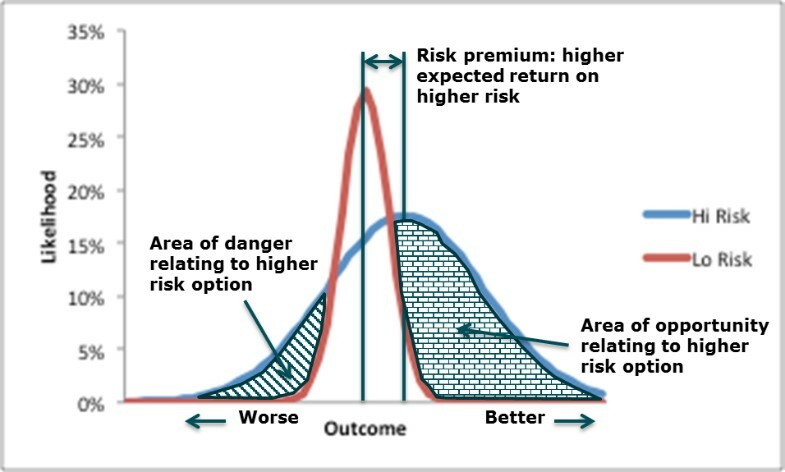 This is the area of opportunity, and represents all the outcomes or returns that are better than our expected outcome, which are more likely to occur if we select the high risk option. What is interesting is that this is a much bigger area than our area of danger. This is because, when we look at risk in this way, there are two important assumptions that lead us to this place. Our risk profile is symmetrical as represented by a normal curve. That means that better than expected outcomes are just as likely to occur as worse than expected outcomes. This is clearly not the way we always think about risk, and when we think of it in terms of possible crisis situations, it generally doesn’t have this symmetry. But in the case of financial investment, and more generally, business innovation, it probably often does. Risk-return thinking is valid. We should expect on average to earn more from a high risk investment than a low one. When looked at like this, there is quite a compelling case for taking more risk. Our chances of doing better are disproportionately higher than our chances of doing worse. It begs the question, if we saw business investment in this way more clearly, would we be inclined to take more risk. The reality appears to be that we tend to be drawn to focus more on the smaller shaded danger zone on the left , almost like Greek sailors to the siren call. This leads to the phenomenon of “loss aversion”, which I shall pick up in more detail in Chapter 7, when I talk about illusions and traps.